Ralph Lauren Men's Polo Sport Shirt White Blue Collar Trim Size Small. Condition is Pre-owned. Fair condition. Have signs of wear around collar and armpits. Please refer to pictures. Ralph Lauren Polo Rugby Shirt Men’s Size M. Condition is Pre-owned. Shipped with USPS First Class Package. Has small hole in the chest area, shown in photos otherwise good condition. Measurements on request. Mens Ralph Lauren Blue Striped Polo Shirt Size Medium 100% Pima Cotton. Condition is Pre-owned. Shipped with USPS First Class Package. 4.5 out of 5 stars - NEW Men Polo Ralph Lauren Crew Neck T Shirt Size S M L XL XXL - STANDARD FIT. 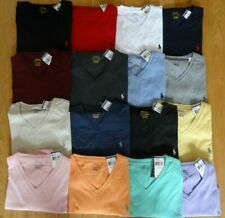 4 product ratings4 product ratings - NEW Men Polo Ralph Lauren Crew Neck T Shirt Size S M L XL XXL - STANDARD FIT. Condition: This Item is inExcellent Pre-Owned Condition! We are trying our best, but mistake can happen. Size XLarge. Blue, gray, black, red, white. Machine wash, tumble dry. Button down collar. The shirt has a button-down point collar. Shirt has a split back yoke with a box pleat that ensures a comfortable fit and a greater range of motion. Ralph Lauren Polo Shirt Men's XXXL Green Short Sleeve 3XL B [Big and Tall]. Condition is Pre-owned. Shipped within 2 business days. Shirt is in great shape! No rips or tears. 2 small black dot stains, pictured. Small hole on the inside collar, not visible while wearing. Pit to pit= 27.5", back of neck to bottom hem= 31. NWT POLO Ralph Lauren SOUTHWESTERN INDIGO PRINT HENLEY. CUSTOM FIT. PRE-OWNED / CLEAN / EXCELLENT CONDITION. LONG SLEEVE / BUTTON DOWN. LIGHT BLUE PINK GREEN. Trending at $61.99eBay determines this price through a machine learned model of the product's sale prices within the last 90 days. Men’s XL Ralph Lauren Long Sleeve Button Down Shirt. Condition is great, pictures show it needs to be ironed. Shipped with USPS First Class Package. RALPH LAUREN POLO Black EDT 125ml 4.2 fl oz COLOGNE "TSTR"
Ralph Lauren is a designer who is known for his preppy aesthetic and traditional style of clothes. His clothing line launched when the company started up in the year 1967. The company sells a variety of formal and casual clothing items. What products are made by Ralph Lauren? 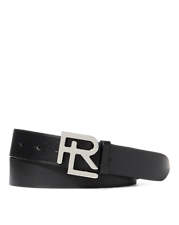 Ralph Lauren creates a variety of different types of clothing, accessories, beauty products, and more for men, women, and children. Formalwear: You can find custom suits, tuxedos, and gowns. Casual outfits: These designs include dresses, slacks, polo shirts, denim, and outerwear along with a variety of shirts, including button-down and crewneck options. Sportswear: Much of the brand's items are designed with activity in mind. Footwear: You can find men's and women's shoes made in a variety of materials and designs, from sneakers to loafers. 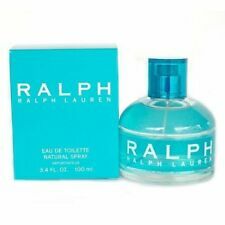 Fragrances: Lauren and Polo are two of the fragrances offered by Ralph Lauren, but there are many other perfumes and colognes made by the brand for men and women too. Jewelry: Lauren creates jewelry that includes clip and post earrings for women, silver- and gold-tone necklaces and bracelets, and statement pieces that feature accents like tassels and gemstones. Home goods: Lauren also makes furniture, linens, china, silver, wallpaper, paint, and other home goods. What is the difference between Lauren's various brands? There are multiple brands attached to the company name. Here are the main products created for each fashion line. 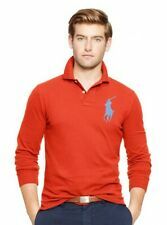 Polo Ralph Lauren: The brand creates sportswear and other clothes for men, women, and children. Ralph by Ralph Lauren: You mostly find men's suits in this line. Lauren Ralph Lauren: This collection includes dresses, dress shirts, dress pants, tuxedos, and women's footwear. Chaps: This is a line of casual clothes. Double RL: This line of selvage denim and vintage apparel has a military and workwear inspiration. Pink Pony: Lauren uses this line to create women's sportswear. Denim & Supply: These clothes have a style inspired by music festivals. What are some features of Ralph Lauren shirts? 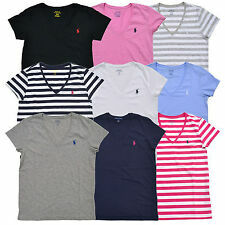 Ralph Lauren shirts come in bright, pastel, and dark shades of various colors. The shirts may just be one solid color, or they may be multi-colored. Striped and plaid shirts are available. Often the brand logo appears on the top left side of the shirts. How old is the Ralph Lauren company? The company got its start in the year 1967 when 28-year-old Lauren began a line of ties. He then expanded to an entire collection of menswear. 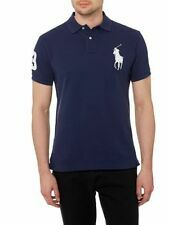 The Polo line was created in 1968. By the year 1971, Lauren had also created a women's collection. Content provided for informational purposes only. 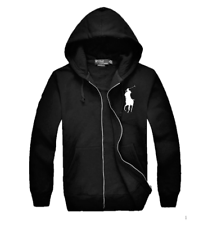 eBay is not affiliated with or endorsed by Ralph Lauren.